Flower essences are an amazing and lesser-known healing resource that can be quite amazing for expectant and new mamas, and, really, anyone. We offer a line of flower essences by Santosha Birth and Wellness that are specifically for conception, pregnancy, birth and motherhood. We also have a new acupuncturist that is trained in the use of flower essences. With all the buzz about flower essences, we wanted to share a bit more about what flower essences are and why they are so wonderful for the childbearing cycle. Flower essences are type of botanical medicine that works on the energetic level (like acupuncture does) to positively affect the emotions, energy, and deeper soul levels. Flower essences are especially suited to helping people overcome obstacles, heal the past, reduce negative thoughts, actions and perspectives, cope with changes and challenges, and achieve greater joy and peace. Put simply, flower essences are energy medicine—they safely and effectively address root causes of emotional and physical issues to bring healing and growth on all levels (physical, emotional, mental and soul). Odorless and virtually tasteless, a flower essence is an infusion of flowers stabilized in water and a small amount of brandy to preserve. What is the history of flower essences? Flower essence therapy has been used by indigenous people for centuries and have been thoroughly studied and developed in the West for over a century. Dr. Bach, a British physician and homeopathic doctor, was the first to develop a robust system of flower essence therapy in the early 1900s. His system included 38 flower essences and his blend, Rescue Remedy® is the most famous of all flower essences. Dr. Bach’s early death left room for further development and refinement of this system and additional flower essences have been added to this healing system. Master herbalists such a German healer Julia Graves (creator of the Lily Circle) and Flower Essence Service, among others, have continued Dr. Bach’s legacy, producing high quality flower essences that yield profound results. 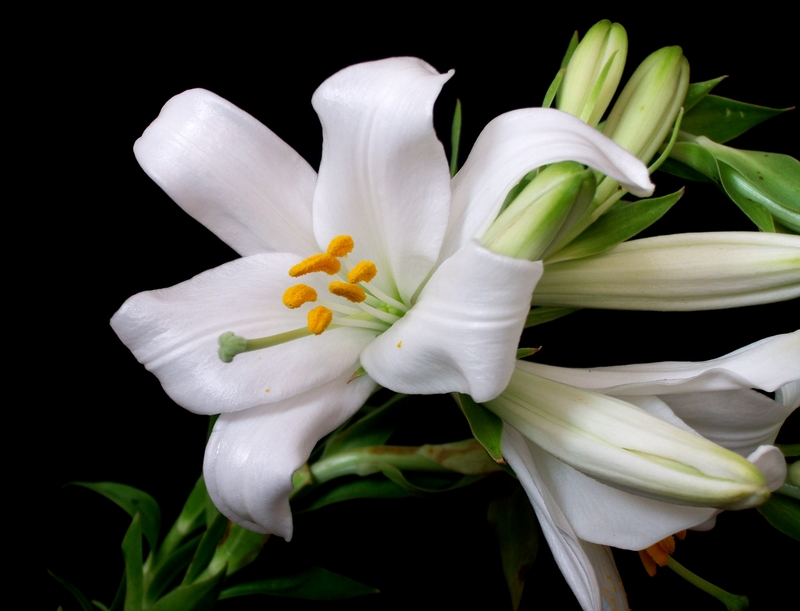 The Lily Circle (used in Santosha's blends) is exceptionally well suited for female archetypal issues and those surrounding birth and motherhood, but are equally powerful and healing for all people. There are so many reasons why flower essences are an incredible healing tool, especially in the childbearing cycle. They are safe: Because flower essences work on the energetic rather than biochemical level, they don’t pose the same risks that some pharmaceuticals, herbal tinctures, and essential oils may pose. This makes flower essences particularly attractive for treating issues that may arise in the childbearing cycle, when other treatments may not be advised. Flower essences are completely safe for use in pregnant women, birthing women, nursing women, newborns, infants, and children (and even pets and plants, evidence shows!). There are NO known contraindications. They are gentle: Flower essences are gentle, they don’t work by force, nor do they overwhelm the body or mind. Flower essences are subtle, yet powerful and profound in the positive change they produce. They address root causes of physical ailments and emotional/spiritual conditions. Flower essences often get to the source of one’s physical or other ailments. By addressing underlying emotional/mental/energetic/spiritual factors contributing to dis-ease or challenges, flower essences heal the deeper levels of one’s being and when they are healed, the body follows. What better time than pregnancy to clear out what doesn’t serve us and make room for greater wellbeing in parenthood? The healthier and happy we are going into parenting, the better we can be for ourselves and our children! How do you use a flower essence? Flower essences are commonly taken by mouth, with 4 drops taken orally 4 times a day. This is a general guideline—a person in an acute situation (e.g. labor) may take an essence as frequently as every 10 minutes as needed. Taking an essence frequently is the path to desired change. Because there is a small amount of brandy in the essence, some pregnant women or sensitive individuals may prefer not to take the essence directly under the tongue. You can add an essence to beverage—covered water is best (but tea or juice can also be used). For those that wish to avoid ingestion entirely, flower essences can be sprayed or applied on to the skin, clothing, bedding or air. One can also take a flower essence bath. How long should one use a flower essence? Many flower essence practitioners note a definite cycle period in taking a flower essence, typically two to four weeks though this can be longer or shorter for some and depending on the reason for use. Can flower essences be used together with other healing modalities? Flower essences can be used alone or in conjunction with other therapies to enhance a healing process. They have been used with great success by flower essence practitioners, naturopathic doctors, massage therapists, psychologists, medical doctors, veterinarians, and other health care practitioners. How do I learn more? If you want to learn more about flower essences, you can speak with us at an upcoming appointment or contact Santosha Birth and Wellness directly at www.santoshamama.com. I'm Not Pregnant - Why Should I Consider a Birth Center for Care? I Don't Like My Provider! Is It Too Late to Transfer?